A common myth got shattered last week when the entity known as the Local News Service lost one of its three subscribing Atlanta TV stations. The myth is this: That the “news media” is a conspiratorial, monolithic entity that works in lockstep to feed garbage and liberalism to the masses. The truth is much, much messier. 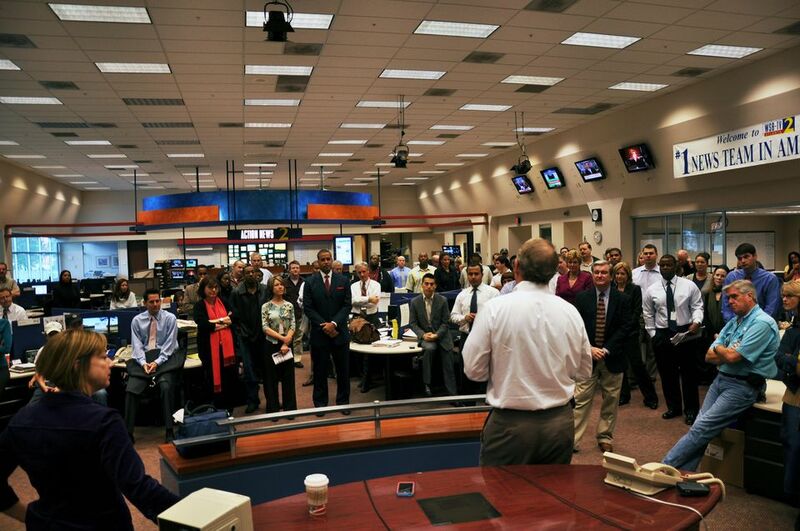 In Atlanta, there is very little about the news media that is in lockstep. Sure, they show up at the same stories. They often make similar judgments, the sort that deliver stories like the Cobb County cheerleader thief as the lead for newscasts from Atlanta to Timbuktu. But they are also independent and competitive. Their independence is what keeps WSB from participating in newly-formed pool arrangements like LNS and the helicopter sharing arrangement between WAGA and WXIA. And surprisingly dissimilar news judgment forced WGCL from the LNS last week. LNS was formed as a cost-effective way to cover stories considered no-brainers: Press conferences, low-priority but essential ceremonies and events, the occasional meeting and such. One photographer covered this stuff and sent it to all three LNS member stations. Now there are only two: WAGA and WXIA. WGCL got out after a series of questionable LNS assignments: It shot press conferences WGCL didn’t want to use. It shot a promotional event for a grocery store. It shot AFLAC night at a Braves game. And LNS is apparently slow to respond to breaking news, probably because the TV stations are playing chicken with one another to see who knows about what breaking news, and how soon. News directors are the most competitive individuals among the hundreds of people employed by Atlanta’s four TV newsrooms. The news directors at WAGA, WXIA and WGCL agreed to LNS as an experiment. WGCL’s news director, a driven Philly guy named Steve Schwaid, was apparently unwilling to experiment for very long. WGCL also declined to participate in the helicopter-sharing arrangement with WAGA and WXIA. Economic pressures will probably compel a re-examination of that position. The question will be: Will WSB consider teaming up with WGCL, or will WGCL join the WAGA/WXIA alliance? It’s a question for another day. As we’ve said before: LNS makes sense given contracting TV revenues. So does the helicopter-sharing agreement. But it’s kinda comforting to see that it isn’t too easy. Wouldn’t want anybody to think that “the media” is anything other than a collection of independent entities making independent judgments, all in the pursuit of better stories and a bigger audience. This entry was posted in schwaid steve, WAGA, WGCL, WSB, WXIA on July 10, 2009 by live apt fire. The LNS pool camera idea was not locally born, but is being pushed across the country by affiliates of FOX. From what I hear, WSB has no intention of joining — and as the #1 station, that’s not surprising. The more interesting question is whether WSB will sit quietly by and allow their competition to team up like this. After all, it does raise certain antitrust questions. In fact, that is precisely why WSB is free to join the LNS any time it decides it wants to. WSB can wait six months, or a year, or two years, or whatever… without any investment or risk — and the other stations still have to allow it to join if it wants to! Likewise, WGCL could return at any time should it desire. Generally speaking, competition is good. This kind of alliance between Atlanta’s news media is born of desperation, and, I think, the first real sign of the beginning of the end. There are not enough advertising dollars out there to support four local newscasts. As I suspected some time back, LNS would be DOA. Anybody who remembers the often short lived collaborations between radio newsrooms and t-v assignment desks should be nodding in agreement right about now. As you mentioned in your commentary, news directors are genetically turf wired and consider it heresy to give up any of it no matter what they promised when putting the deal together. It’s going to take a lot more than just nibbling around the edges to get looming budget problems under control. I believe that the time when LNS was announced, I proclaimed that it was going to be a refreshing departure from the zero-sum mentality. Oh, well, never mind. And, I’m not so sure about the term “zero-sum mentality” being applicable in this instance anyway. Have at it, I still believe in the free market. Everytime I read your posts, I wonder why you visit this site. You are clearly not a local television person, however, I believe you to be smarter than the average bear, but your comments are largely boo boos. Those of us here at Fox5 are amazed how much we work with wxia and we wonder why. Why help them? WSB and WGCL have the right idea. The stuff we share is junk and makes us look stupid. Why? Because the way things are going at Gannett, Fox5 and 11Alive could soon be one and the same, or so I’ve heard. I don’t fully understand the logistics of it all but I don’t know that its outside the realm of possibility.